SVE follows up its 800-hp custom Corvette with a monstrous Camaro. New Jersey’s (SVE) was recently featured on Cartownhack for its Yenko Corvette, a highly customized Corvette Grand Sport . Now SVE has set its sights on the Camaro SS, and the result is another 800-horsepower beast. The engine under the carbon fiber hood was built by SVE and features a custom supercharger, forged steel crankshaft and H-beam rods, forged aluminum pistons, CNC ported and polished LT-1 cylinder heads and LT-4 fuel system and injectors. In addition to the custom engine there is custom badging indicating the Yenko heritage—SVE uses Don Yenko's name under license—and the Camaro’s new horsepower output. The paint job is sharp, as are those 20-inch wheels. The interior doesn’t look all that special, save for the custom embroidery on the seats and the door sills. 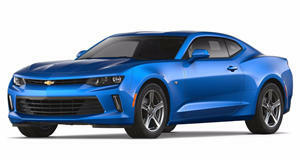 Like the Yenko Corvette before it, SVE’s take on the Camaro SS does not come cheap. The company has priced its Hellcat-killer at $40,000, a price which does not include the cost of the donor car. The good news is that your money buys more than just a custom engine and an awesome paint job. Only 50 of these Camaros will be made, which means that buying one gives you access to a small and exclusive club. Performance figures were not released, if a human is rowing the gears. The quarter-mile will be where the SVE Yanko Camaro SS really shines, though. Could an extra 345 horsepower make it a 10-second car? For reference the stock Camaro SS with an automatic transmission does the 1/4 mile in 12.3 seconds. but should still get the job done.